John Burroughs' Boyhood Home, Completely Restored. 5 bedrooms, 3 full bathrooms, sleeps 10 comfortably. Great room/ LR/ den. Beautifully restored, extremely private, ca. 1850 farmhouse - John Burroughs' 'Old Home'. Unsurpassed views, hundreds of acres to explore, and many local family activities for all four seasons. The East Branch of the Delaware River flows through town; the Pepacton Reservoir is 15 minutes away. Ski Plattekill is just over the mountain; Belleayre, Hunter and Windham are within 45 minutes; Pakatakan Farmers Market; Roxbury Arts Group; and Cooperstown (National Baseball Hall of Fame - 1 hour away). Golf at Shepard Hills a stone's throw away, or at Hanah fifteen minutes away. Roscoe (fly fishing) is an hour away. Skiing, golfing, hiking, fishing, hunting, and places of great interest are all close by. The John Burroughs Memorial State Historic Site (his burial place) is just up the road, adjacent to the farm, as is Woodchuck Lodge. Walk the land that inspired John Burroughs, and drink from the same spring that has supplied the house since it was built. The Homestead has been completely updated and restored, and everything is brand new. The furnishings are all new (Restoration Hardware and Pottery Barn), supplemented with a few vintage pieces. The house has a cook's kitchen/great room, with all new Bosch appliances, and a Tulikivi wood-burning stove (table seats 10). The living room has a wood-burning stove and tv (DirecTV); the den has a tv. There is wireless satellite high speed internet. Second floor laundry room has Bosch front loading (he) washer and dryer. Bed linens and towels are provided. In addition, there is a restored shed adjacent to the barn, in which you can store your sports equipment (bikes, golf clubs); there are two 'cages' so - please bring your own padlock(s) if you wish to secure your belongings there. Brand new Weber gas grill and outdoor seating for 10.
toilet, tub, Master bedroom en suite (2nd floor). toilet, shower, 2nd floor hall bath. All bathroom fixtures are brand new (master bath has vintage claw foot tub). Restoration Hardware vanities and hardware. All brand new Pottery Barn towels provided. 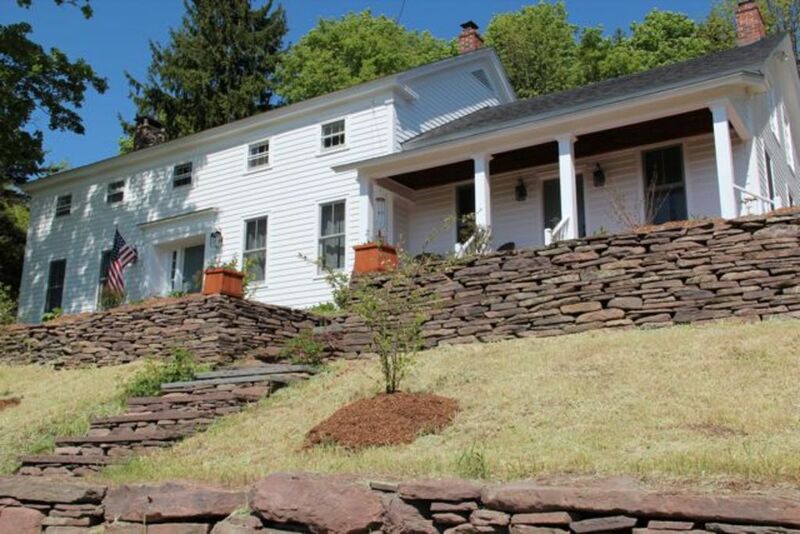 House is located on John Burroughs' Old Clump Mountain. Brand new Bosch he (front loading) washer in separate laundry room on 2nd floor. Brand new Bosch dryer in separate laundry room on 2nd floor. Wireless satellite high speed internet provided. (2) One in living room; one Tulikivi soapstone stove in kitchen/greatroom. Ice and water dispenser on door. Brand new cook's kitchen with all new Bosch appliances: dishwasher, microwave, refrigerator/freezer, range, and second oven (wall). Counter with 4 stools. Flat screen tvs located in living room and den. Completely updated and restored historic home (ca. 1850). Cook's kitchen has all new Bosch appliances with second wall oven; 4 counter stools. Kitchen/great room has soapstone wood burning stove. Living room has wood-burning stove and flat screen tv. Den has second flat screen tv. (DirecTV). All new Restoration Hardware and Pottery Barn furnishings and amenities, supplemented with some vintage items. We had a lovely 2-night stay over the holidays with three families with kids. The house is fully renovated and well furnished and stocked with everything you could possibly need (pots, pans, toiletries, towels, games). The property was also really beautiful with great views. We didn’t get great weather for skiing but there were a few mountains very close by. We ended up spending most of the time at the house with a fire in the fireplace, playing board games and making meals in the lovely kitchen, which was perfect for us. Lastly, the owner was friendly and very responsive throughout the booking experience and our stay. The entire house is very tastefully decorated and is in a beautiful location. We enjoyed learning about who John Burroughs was. Excellent kitchen for entertaining. Beautiful area...beautiful home. All rooms were absolutely beautiful. Host was awesome. Loved the added touches that really made us feel welcomed. We just came back from JB's boyhood home. Great place. The house is very very comfortable. Everything works, beds are comfy, kitchen is very well equipped, 2 fireplaces, 2 big TVs with Direct TV, wifi works. Loved the location, as we were looking for a calm place away from the city noise. Went skiing to Plattekill which is just 15' away and is a great family friendly mountain. Nice supermarket in Margaretville 20' away. Will be back for sure. Highly recommendable!! The owner has not just restore the property but has created a restoration beyond compare perfect for my four siblings and their spouses for my daughters wedding. What a wonderful family reunion we had! This is a beautiful house, well taken care of with lovely amenities like monogrammed towels! The house is huge with a great kitchen and dining room table and two living rooms. We rented this for the groomsmen and their significant others for our wedding and it was perfect to keep them comfortable and for wedding day pictures. I would definitely come back and stay here. Very close to the Inn at West Settlement. $230/$250 cleaning fee per rental or once per each week of rental, depending on size of party, length of stay, and holiday. Rental and cleaning fees are subject to sales tax (Delaware County). A minimum deposit of at least 20% of rental fee is required to secure reservation. Rental is strictly limited to a maximum of 10 occupants. No smoking; no pets. See website for more information.